Our favorite fish sandwich in Key West - from an island legend. 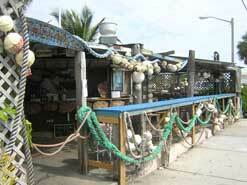 B.O.’s Fish Wagon, classic “Key West”, serves up our favorite island sandwich. When people ask us where to get a great fish sandwich in Key West, this is where we send them: B.O.’s Fish Wagon. Yes, it looks like a shack that a hurricane blew to pieces. That’s because it has…more than once. Owner Buddy Owen (hence the B.O.’s…you didn’t think it mean’t something else, did you?) has been through a few hurricanes, and afterwards picks up the pieces and nails it all back together. A true Key West character, this man is beloved by many. Outstanding fresh fish sandwiches are served on fresh-baked Cuban bread with B.O.’s famous Key Lime sauce. Also offered are burgers, conch fritters, french fries, hot dogs, and other delicious finger foods. Outdoor covered seating gives a great view of island life near the Historic Seaport. Location: The small eatery sits on the corner of Caroline and William Streets, across the parking lot from the Waterfront Market. Fries: Large $4.00, small $2.00.